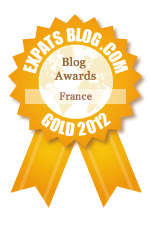 ExpatsBlog.com Expat Blog Awards 2012: France Gold Award! This blog won the Gold Award for best expat blog in France! Congratulations for the nomination! Your blog is very educational, refreshing, and fun to read! The pictures are awesome. They really give me a glimpse of what it's like to live in all of those different places. I always end up wanting to travel to all of them after reading your blog, especially Paris. Your photos of the food and wine are my favourites! I can almost taste them! For a Canadian who has been living in France for a short amount of time, this blogger sure knows how to live la belle vie in France. I always look forward to reading her posts about Paris' best-kept secrets; from the exclusive restaurants on Rue Gravilliers, to the must-see art exhibitions at the Pompidou. This blog is for anyone interested in travelling, and especially enlightening for those who want to live in France in the future. love her photos and the way she blogs to educate us on how it is to live in paris! nice places to visit soon.. Your blog is always very informative and interesting, making me miss my days of Worldwide Travel. Reading your Blog is always refreshing, like being greeted by daily sunshine! Simpley love her fantastic photos! What is not to love ? Paris and Little Pieces of Light ! My favorite daily distraction with little reminders about beautiful, cozy, comforting, thought-provoking things that surround us, which makes the blog equally interesting for those who are and aren't interested in Paris life. Lovely glimpses into travels and observations of an explorer of all that's keeps us going in busy lifes. congratulations !...your blog is very interesting and informative.. This is one of my favorite blogs that I read over my breakfast. Beautiful photos, inspiring quotes and some hilarious tips on how to succeed as a woman in Paris.....what's not to love?! I always enjoy the photos on this blog. I get a rush of good feelings when I see a new view of the Eiffel tower, or any of the other photos portrayed here. This is a real gem. As a Parisian who has been living around the world for the past 15 years, I think that Little Pieces of Light speaks to both expats and non-expats just as well. I go to Paris very often and always can't wait to check the blog's last posts for new places to try and exhibits to see. The pics are gorgeous, the writing witty, the quotes always perfectly chosen...What a refreshing and inspirational creation that always reminds us of opening our eyes to all the happy little things around us! Congratulations for the nomination and thank you for bringing light and joy to our daily lives! This is one of my favorite blogs on Paris - I check in every morning! I love this blog, because it gives you a really good image of the countries. I also really love the way everything's written and the beautiful artistic pictures! I love reading this blog because of the insightful little insider tips into such a wonderful city. It's exactly the type of thing that I look for when I travel in order to really experience a city like a local. And of course, the writing and pictures are just as beautiful as the city itself. Such a wonderful blog! Love this blog! It's always very informative and educational, and the pictures, especially, are always so appealling. Jewelries are the least of my concerns and I'm a novice with regard to their appraisal and appreciation, but this blog, Little Pieces of Light, awakened my interest and en kindle a fire of desire for them. Great pictures and descriptions of them. Thanks a lot to the writer, I am now to start my adventure to the wonderful world of "little pieces of lights." Congratulations! This is a great blog, well done. Congratulations! Such richness in information made me open my eyes and realize that the world I live in is bigger and lovelier than I imagined before. I follow this blog avidly - and always refer to it for fun places to visit and eat at when in Paris! The food recommendations are always excellent, and I love the author's musings on life and the several beautiful things in Paris. I wish I could have been in Paris to participate in the Macaroon smackdown!!! Little Pieces of Light finds the interesting angles on expatriate life in France. Covering everything from homesickness to hole-in-the wall eateries, this blog covers it all in a touching and elegant manner. When people ask me about moving to Paris or living abroad, I direct them to this blog, which gets the highs and the lows just right. It really makes everyone want to live la vie en rose. Keep up the good work! Eiffel Tower Tuesdays are very nice, as well as the honnest restaurant reviews. Amazing photos! Hope I get to go to Paris soon! Little Pieces of Light broadens the mind of all readers around, and allows them to live vicariously through such a cultered journey! I do not travel, so this blog takes me away at times. It is truly lovely as it muses on food/entertaining/dining and all leisurely activities to do with Paris. Thank you! A refreshing stream of beautifully expressed consciousness about discoveries and experiences that each of us could be making. Maybe that's the reason for why it's so engaging to read-- there's Little Pieces of Light in all of us. And the wonderful pictures just make you wish you could carry the author with you at all times to document your life! I'm always looking for information on the hidden gems of the cities I visit. I have relied heavily on 'Little Pieces of Light' when I come to Paris! The posts are fun, quirky and virtually transport me to the moment. I now recommend to friends and colleagues who are invariable grateful for the inside information! A great daily break from the inevitable rain and cold of london! I am obsessed with this blog! It;s fresh, honest and helpful! The wonderful little tips into such amazing cities makes this blog a first stop for any would be traveler! Little pieces of light is the perfect way to end the day. The photos and the writing are just as great as the blog. Get reading people - what are you waiting for! Having visited Paris many times in my life and being fairly familiar with the city, I still find myself reading this blog often and learning new things. It never ceases to remind how beautiful Paris is, and all the hinden wonders that it contains. There are endless amounts of things to see and do in Paris, and this blog gives readers a little taste of what life in Paris is like. This blog does a excellent job of portraying the city for what it is. It is informative, fun, current, and easy to read! The pictures are very professional and appropriate. I like this tips very much, they are well done, useful and when I need information, I always use this blog! Paris is one of the loveliest European cities I've visited so far, and this blog does justice to it! Beautiful photographs, and some tongue-in-cheek, humorous prose keep this blog fresh. I lived in Paris for 10 months and I learnt about the blog about half way through my stay. I must admit it is funny to what extent an internet blog can improve your real life. My definitely favourite category was the social calendar where the author did the job for me when it came to weekend planning. Finally, I felt really sad when the post about foreign food restaurants in Paris came out after I left the city. I think I am just going to visit all of them by the list next time I am in Paris. Simply SPLENDID!!!! A genuine pleasure to read! Been an expat my entire life, lived in 10 countries to date including Paris, and your blog has been the greatest tool to exploring Paris' true character. There is a plethora of stuff out there (travel shows, guide books, etc) all which cover the same basic things. Your approach has been refreshing. Smart, witty, romantic, poetic, beautiful...heck all the reasons why we fall in love with Paris and the French. Thanks for the laughs! Camilla's personal charm really comes across in her writing. I always felt like I was reading my best friend's dispatches from Paris. Love those photos of Paris, make me want to go back there one more timne. I haven't travelled the world so much, but the last 3 breaks I had in the last 2 years, I spent at least a week each in Paris. What an enchanting place to be. Reading your blog makes me feel as though I never actually left the city. Am so grateful for the social calendar every month!! Her museum/music/food/culture reviews and recs are always spot on. Love this blog! Makes me want to return to Paris. Very informative, and definitely not lacking in great photography. Makes me hungry and reminisce and about French/European food every time I read this blog. It's my mini vacation between trips. Being a world traveller myself, it's always great to find the insider's guide to what's fabulous in certain cities. Camilla's insights on Paris from a North American perspective is fantastic. I loved the post about the Macaron Smackdown. It was such a unique and fun way to learn about Paris' best macaron houses. I'll definitely be visiting Carette and Pierre HermÃ© the next time I'm there. I'm impressed with your positive, can do message. Each of your photographs is stunning, very professional. Your musings are sprinkled with warmth, wit, and positive energy. I'm definitely a big fan!!!!! Reading Little Pieces of Light always makes me take a step back from my day to day life and dream of my next adventure. The writer has a lovely way to express (both in photos and text) their love for food, wine and life! It is hard to not walk away from reading each blog without a smile on my face! this blog is enlightening and informative...the entries capture the side of paris and buenos aires that are not often read in tourist guides or common write ups on the net. it showcases gastronomic finds that sound epicurean and worth every single penny. i love the fact that the blogger presents a fresh perspective on familiar sights in both cities, insights that warm the heart and pictures that entice me to hop on the next plane ride to both destinations. i've been to paris before and would certainly go back there and explore the places featured here. and buenos aires? yup, it surely is on one of the top ten places to see for me and my hubby. I love this blog!! One of my favorite posts was reading about the amazing macaroons Paris has to offer!! What a fantastic blog!! Very interesting and informative! Love all the details. Definitely makes me want to see all these exotic places for myself!!! I have been following this blog since its inception, and even today, I am still surprised by the sensibility in its writing and always welcome its invitation to a journey into arts or gastronomy. Considering myself as a core Parisian, this blog remains a source of inspiration for my day-to-day discovery of the old French capital. Please never stop, I want to be amazed again. Great blog! I visit often and always leave feeling rejuvinated! The lovely photos allow me to experience "little pieces of light" through the eyes of another! Perfect to read over a nice sip of coffee on a beautiful warm day.. Seems exiting! Wish i could try out these places. Great blog! Very interesting, and fun to read! The photos are awesome too! love the work on the blog =) ! 10 things I hate about Paris. Genius. Something about reading about the bad things about the place makes me feel really happy. Excellent blog! Awesome read, love the style of writing! Keep up the lovely work! Awesome blog! Definitely really eye opening posts about France and in general just a great read! I'm a foodie and a photo junkie! I LOOOOOVVEE this blog!! Knowing we come from the same place gives me hopes for my prospective future abroad. I love this blog! So informative!! Congrats on your nomination! I'm so jealous. I'm totally missing on the Paris experience. Your blog takes me away to Paris in every post. I started reading when I was first planning to visit and have not stopped since. I love Eiffel Tower Tuesdays - there can never be enough pictures of the lady!